Life is giving me so many opportunities to be better person, stronger than ever and do something in life that is really important to me and always for a good cause. Couple weeks ago I received an email for a nice lady who wanted to be in contact with me to offer me a really nice opportunity. 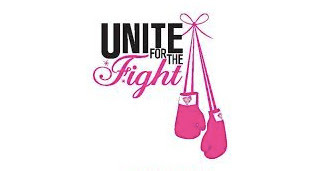 My surprise was huge when I read the email than they wanted me to be the person to celebrate and honor at the Unite For The Fight Breast Cancer Walk Saturday, October 3, 2015 in Fort Lauderdale. What a fabulous HONOR! Because who I am? I'm Angeles , I have Cancer and I am not the only one but she wrote so beautiful words about me that I was overwhelming. "We have been a fan of your fashion blog so we have been following with you on your journey, and feel you are are an empowering and inspiring women to recognize and celebrate"
WOW! And of course I had to say YES! Thank you to Katie Centorrino Masucci for contacted me and Traci Lynn Jewelry for this chance to be part in such wonderful event! 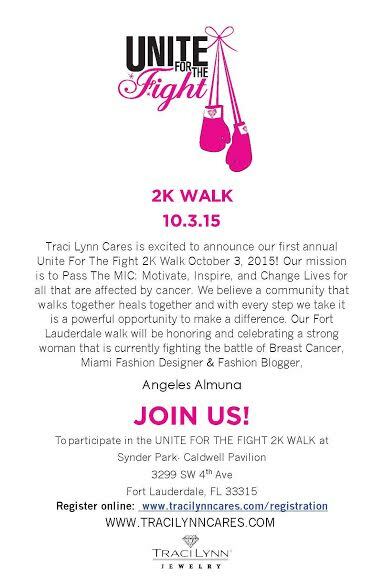 So, my dearest friend, family and readers you are invited to this special event Saturday, October 3 2015 in Fort Lauderdale. Wear something pink and be happy! LOVE to me I will win this battle so soon! Come to say HELLO and open your mind to know more about the BIG C and me! Dear Angeles go ahead and give the beat fight seen before, I' ll sending the best vibs my heart is withyou!! !